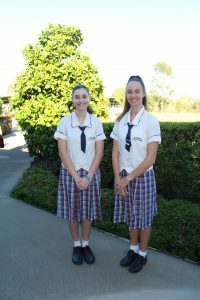 In the last week of term two, we were two of nine students from the Atherton Tablelands who travelled to Brisbane to participate in the Science Live Project held at Griffith University. During this trip, we spent two days with PhD researchers and other reputable scientists and technology professors at both the Nathan and Gold Coast campuses to participate in engaging and educational activities. On Monday, we travelled to the Gold Coast Drug Institution and met pharmacologist Dr Gary Grant, who led the activities. This included an interesting information session on the different medicinal drugs that exist and how they are to be effectively used. One of the many facts that we learnt, is that giving dogs chocolate and cheese has the same effect as giving them methamphetamine. We were also able to work with virtual drug discovery technology, including glasses, that projected a computer screen onto the lenses and hand recognition technolog y to control the movement of a virtual skeleton. A tour of the campus followed, including a visit to several pharmacy testing labs that contain billions of dollars’ worth of equipment for creating drugs. Our concluding activity was using a virtual lab to diagnose an illness using methods that are practised by scientists and medical professionals today. For Tuesday’s activities, we stayed at the Nathan campus to visit the Griffith Institute for Drug Discovery (GRIDD), which is a research foundation. Upon arrival, we met George Mellick, the Head at GRIDD, who also happens to be from Mareeba. Once joining with the other students, we separated into four groups that completed four activities run by specialised PhD students and graduates. The activities were a tour of GRIDD, which helped us to gain an insight in the latest drug discoveries, including the first spinal cord cure that proved successful on humans; an activity where we were able to prepare blood smears and count parasites; a plant compound extraction, to replicate what is often done when in the process of creating a new drug; and thin layer chromatography, which is a process used to separate materials and to identify and distinguish between different drugs and their properties. On our final day, we were able to meet and join some of the Lions Club members who had assisted in making this trip possible, and we were able to personally thank them for creating such opportunities for interested students. We would also like to extend our greatest gratitude for our local Lion’s Club for sponsoring us. For the remainder of our stay in Brisbane, we explored the eco centre and acquired a taste for environmental science. Throughout the trip, we also had time to explore Brisbane, including taking a trip to enjoy Nitrogenie ice-cream and the Wheel of Brisbane at Southbank, as well as a trip to Skyzone. We are both grateful for this incredible experience and all the knowledge we gained, and we hope that this programme continues into the future, so other students can also take part.